AMES, IA (May 26, 2018) - Dusty Drenth and Dennis Bull (-15) put together two fine days of golf. 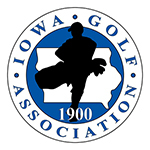 After opening the 23rd IGA Four-Ball at Veenker Memorial Golf Course in Ames with a 64 (-8), posted 65 (-7) to outdistance the side of Matthew Walker/Aaron O’Brien by two strokes. Bull/Drenth (pictured above) made a total of birdies over two rounds. The side of Bill Matzdorf/Jason Thornbrugh turned in tournament low round in Saturday’s final round, firing 62 (-10) to finish at -12, three strokes off the lead. Drenth praised the play of his partner as well. The win marked the first IGA victory for Bull after many near misses. In the Senior Division, Joe Palmer and Terry Cook (pictured right) repeated as champions thanks to 17 birdies between the two of them (twice they both made birdie on the same hole). Palmer/Cook, who posted 64 (-8) in the opening round, followed that up with a 65 (-7) in the final round. The side of Ron Peterson/Jay Gregory also played well, finishing at -13 for the tournament, two strokes back of the lead. 36-hole four-ball stroke play championship with Open and Senior (50+) divisions. Must be a member of an IGA Member Club.